The Israeli army Saturday morning said that it had taken over a European ship, the Swedish-flagged “Freedom,” captained by John Turnbull of Vancouver, that was aimed at breaking the naval blockade imposed on the Gaza Strip by the occupation forces 12 years ago. After the brutal violence and theft that the Norwegian-flagged Al Awda was subjected to, just days before, Captain Turnbull had stated that the participants and crew of the Freedom will not resist if boarded. “We now have confirmed information that S/Y Freedom to Gaza have been boarded on international waters, by Israeli navy. Latest reported position was about 40 nautical miles of the coast of Gaza at 8.06 pm. 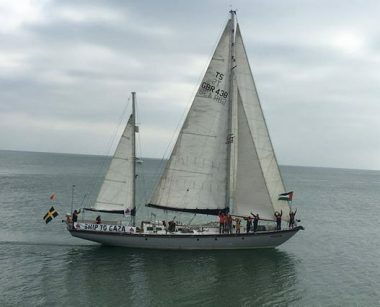 Onboard Freedom for Gaza was a crew of twelve persons from five different countries. They are now captured and taken to Israel against their will (For full list follow this link). The boat also carries a cargo of medical supplies. In this situation, the demands of Ship to Gaza are that the ship with its crew and cargo will be returned to the site of the boarding, and that they will be allowed to go in peace through international and Palestinian waters in accordance to international law. In effect, this is a demand that the eleven years-long illegal and destructive blockade on Gaza will be lifted at last. The government of Sweden have repeatedly stood behind demands on a lifting of the blockade. The ship was towed to a military base in Ashdod, and the activists were detained on board. In related news, elder and former Chief of the Stó:lō Nation Larry Commodore has returned to Turtle Island after joining the Freedom Flotilla to challenge the illegal blockade of Gaza, in late July. Along with 21 other international participants on board the Norwegian-flagged Al Awda (The Return), Commodore was brutally attacked and kidnapped by Israeli forces in international waters, last Sunday, and unlawfully detained for four days, in Israel. Upon his return home, he was greeted with traditional gifts of tobacco, sweetgrass and sage at Toronto Airport, on the ancestral lands of Haudenosaunee and Anishnaabe peoples, where he rested overnight. He will arrive this afternoon in Vancouver, unceded Coastal Salish territory, where he will be welcomed by family, community and friends who share his deep concern for the ongoing suffering of Palestinians in Gaza and indigenous rights everywhere.